Thirty three times, the genealogical community has honored one of our best, one that we’ve lost. Thirty three times, the focus has been on someone who has made contributions to the field of genealogy that were of lasting significance in ways that were unique, pioneering, or exemplary. Thirty three times, individual genealogists and groups have nominated those persons whose achievements or contributions have made an impact on the field — and one has been selected: a genealogist whose unique, pioneering, or exemplary work lives on today. Starting in 1986 with Donald Lines Jacobus and continuing to 2018 with Mary Smith Fay, 24 men and nine women have been elected to the National Genealogy Hall of Fame. Mary Smith Fay was one of the country’s most eminent genealogists. She became a professional genealogist after retiring from the Shell Oil Company in 1969. Her research interests spanned the entire Eastern United States from New England to Texas, which led her to author two books and over three dozen articles, all of which highlighted her genealogical research skills. Her professional work included serving as genealogist for the Howard Hughes estate and investigating claims of those purporting to be his heirs. She was active in numerous genealogical societies, and lectured at both local and national genealogical conferences. Mary Fay was born in Burnt Prairie, Illinois on 27 August 1915; she died in Houston, Texas on 7 July 2000. In 1988 she published the Fay genealogy, Edwin Fay of Vermont and Alabama 1794–1876: His Origins from 1656 and His Descendants to 1987, preceded in 1979 by War of 1812 Veterans in Texas. Numerous articles appeared in the major genealogy journals. Notably, “The Three James Hickmans: Identifying Revolutionary War Veterans,” Virginia Genealogist, 41 (1997): 52–54; “Genealogy of Howard Robard Hughes, Jr.,” National Genealogical Society Quarterly, 71 (1983): 1–12; “Sheltons of Connecticut to Texas,” The Genealogist, 2:1 (Spring 1981): 115–23; and “Some Descendants of Richard and Sarah (Best) Tritton of Halifax, Nova Scotia, and New Haven, Connecticut,” New England Historical and Genealogical Register, 145 (1991): 125–28. Thirty three of our best… And, now, it’s up to us to help select the 34th person. The National Genealogical Society and the National Genealogy Hall of Fame Committee are seeking nominations from the entire genealogical community for persons whose achievements or contributions have made an impact on the field. The next honoree and the society that honored the nominee will be announced at the NGS 2019 Family History Conference in St. Charles, Missouri, in May. 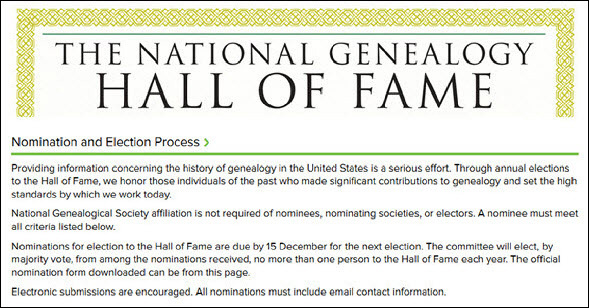 Nominations for election to the National Genealogy Hall of Fame are made by genealogical societies and historical societies throughout the United States, and have to be submitted by 15 December 2018.